The atmosphere in the lab was filled with excitement. The students were packed. Some had laptops, years 10 and 11. They sat on the floor. The year 8s, who formed the bulk of the group, and 9s were seated at tables and using iMacs. 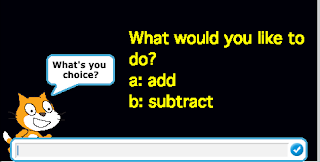 Apart from the compulsory welcome talk, we created a simple program in Scratch that interacted with the user by asking for two numbers and giving the sum or difference of the numbers, as specified by the user. The students then registered with Ansca Mobile so they could use Corona SDK in the future. Throughout the lesson, I found myself weaving around the students on the floor to get to those on the table. There was some chaos, but not the sort that you would wish to bring order to! Having Steven and Colleen was great. In Steven, they had an experienced Scratch user. You can see some of his work on: http://scratch.mit.edu/users/AvilaMaths. He worked with a few year 8s he knew well and pushed them beyond the pace of the lesson. Colleen was a learner like themselves. They could see a teacher going through the same process. What I am hoping to achieve this year is to get the students to a stage where they can take an interesting problem and formulate it in such a way that it could be solved by writing a computer program (i.e. by enlisting the help of a computer). Some call this computational thinking. Hopefully, a few simple exercises will teach the students how branching statements and loops work. After that, we can start doing some Mathsy Apps. Our next meeting is in two weeks' time as next Tuesday is our school's Swimming Carnival. We should finish this exercise and start replicating it as an APP for iOS and Android using Corona SDK. Wish us luck. Sounds wonderful. I particularly like the comment "There was some chaos, but not the sort that you would wish to bring order to!" It is from such chaos that wonderful things evolve. Sounds great what you are doing Ziad! Wish my school was so advanced! Great to see it went well Ziad! Thank you for the encouragement, Celia, Bernadette and Karis. I hope the enthusiasm keeps going when things get harder. I am desperate to see us publish an APP on the App Store. Last year, we made the mistake of building a Harry Potter APP. As it turned out, we were doomed! Bernadette, given that you're at a boys' school, there is a high chance that some of the students are already dabbling in APP development. Maybe they could get the ball rolling. I came across your blog after searching for other educational bloggers of a similar theme. My blog focuses more on the middle years and secondary education with a distinct twist towards English and ICT and I'm interested in exchanging links with your blog. My blog is http://buildingthefuture.com.au - feel free to check it and and I hope you enjoy it. Two of my most popular posts are about an article about an essay scaffold template I created (http://buildingthefuture.com.au/essay-scaffold-template) and the Oxford 307 word list (http://buildingthefuture.com.au/oxford-307-word-list). If you'd like to exchange links, please email me back.